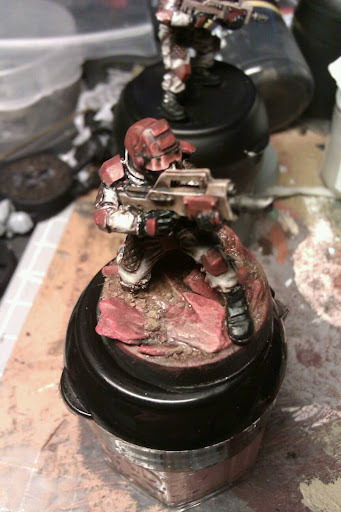 OrbicularisOculi: How To Use My Elysian Drop Troops? How To Use My Elysian Drop Troops? I've been thinking of what I would do with my Elysians? Would I use them as veterans just so that I won't have to paint so many? Should I use them as Stormtroopers? Or should I use them as regular soldiers? If I use them as normal troopers, I have to be able to see witch one is a regular trooper and witch one is an officer. For this I have two options. First up is as you can see in the two pics on the top, one with a shoulder pads and one without. 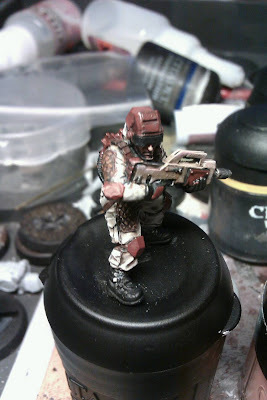 The other option have I not tried yet and that one is to paint the squares on the helmets in white. If I do, should the officers have white details or not? Don't wanna make them look like white shields. Why I worry about painting the details on the helmets is that these minis has already so much details so if I paint white it might look to much. Tonight I also painted on my crashed Valkyrie but since it looks so terrible I don't want to show you, not yet. Since you do not have whiteshields for your DK, then painting them white would be no problem, and it would look good! Should the normal troopers have shoulderpads? Or just the white marking and in that case would I just paint white on the officers? Yes, they look better that way.And the higher ranked they are the more white you should use. The officer might even have a fully white helmet and a black stripe instead, like my tau.